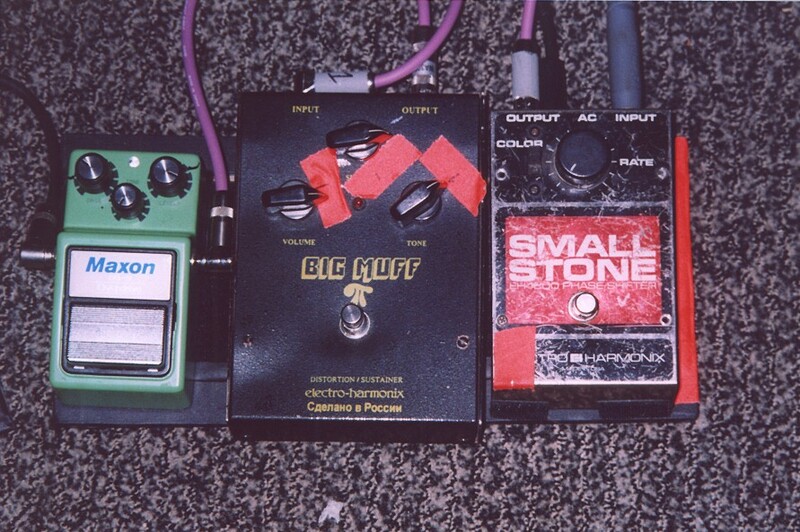 In this photo you can see the EHX Small Stone in Omar's pedalboard in 2009. In this 1997 rig rundown, it is shown that Greenwood used the EHX Small Stone phase shifter pedal. According to Guitar Geek's rig diagram, Bell uses this pedal. As you can see from this picture on instagram, from Tom's studio, he owns/uses the Small Stone, by Electro Harmonix. Kevin's pedalboard, as also seen [here](https://psychexfutureheart.files.wordpress.com/2014/04/11880827-24757692-thumbnail.jpg), includes an Electro-Harmonix Small Stone, in the top half of this photo. Barry Stock points out his Electro-Harmonix Small Stone at 3:59 in this rig rundown video. > Now that I’m using a foot controller and everything is MIDI, our sax player is letting me borrow his rackmount version, so hopefully I won’t be breaking stuff anymore. I also have a ‘70s Electro-Harmonix Small Stone Phase Shifter that I bought a long time ago for like $30 and its been with me since the beginning. It has needed some occasional surgery, but I’ve never heard another Small Stone like it. According to Omega auctions, he also auctioned off this pedal. "Used with omnichord, particularly on ready, able". Seen in the back of the board. "We also used the [Electro-Harmonix chorus] Small Stone box too. It´s like a peaceful wall of sound or something - really nice." "In the July 2013 issue of Premier Guitar magazine, Nancy, described as a “Goddess of Rhythm,” talks about the journey and her gear. EHX is proud that Nancy uses a Holy Grail reverb and Small Stone phase shifter." 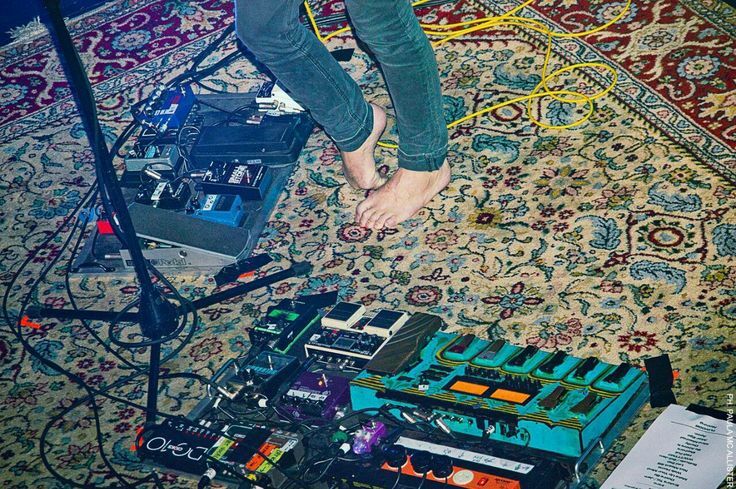 He uses this pedal, according to my interview done with him. "They were all used at some point during the last recording with @sparrows613. We should have hooked them all up at the same time...blew it. #pedals #sonicdestruction #reverbisthenewdelay #compensatingforthesizeofmywhat?!? #notsurehowtospellcompensating"
"Stockdale's pedalboard comprises a Boss TU-2, Radial Tonebone, Fulltone Clyde wah and Supa-Trem, an Electro Harmonix Microsynth and Small Stone phaser, AC Booster and DigiTech Whammy." On Burton's website, it is noted that he used Electro-Harmonix Small Stone Phase Shifter pedal. "I have an old [Electro-Harmonix] Small Stone that I really love. Also, Albini had an EarthQuaker Devices Grand Orbiter phaser that was really cool, too. The Small Stone only has two settings, and it sounds like [the band] Big Star or something." "I usually use an Electro-Harmonix Small Stone on recordings and stuff"
[This](http://www.guitargeek.com/pepper-keenan-down-guitar-rig-and-gear-setup-2008/) detailed gear diagram of Pepper Keenan's Down stage setup includes an Electro-Harmonix Small Stone Phaser. A detailed gear diagram of Kirk Windstein's Down stage setup that traces the signal flow of the equipment in his 2007 guitar rig shows a Electro-Harmonix Small Stone Phase Shifter Guitar Effects Pedal. "Remándola desde abajo los efectos: Afinador Pitch Black, Shaker Vibrato y Hall Reverb TC Electronics, Blogger Fuzz EHX, Whammy Digitech, Micro Pog EHX, Super Octave BOSS, Bass Synth EHX, Dragon Distorsion Cluster, Envelope Filter Micro QTron EHX, Phaser Small Stone EHX…"
At one end of Jurel Sónico's pedalboard, in this photo, his Electro-Harmonix Small Stone pedal can be seen. "Pq a galerinha das cordas tem pedido: Os Amps, Fender Blues Jr III, centro 2 Fender Champ Os efeitos: Jim Dunlop Wah Carl Martin Quattro Leslie Neo Ventilator Q Balls Riddle Electro-Harmonix Phaser Small Stone Electro-Harmonix Delay TC A/B Box Boss"
Right at the middle sits Ruban's Small Stone. (45:58)Tim tells that he's using the small stone phaser pedal, by electro harmonix. It's possible to hear the efect in some parts of "o cinza" and "medo do medo", from the second album. According to this gear photo, which is found under [Denander's gear photos](https://tommydenander.se/photos/gear.html), one of the pedals is the EHX Small Stone phase shifter. This is EHX Small Stone phase shifter pedal. It is vintage as you can see. "With so many sounds on the GOASTT record to reproduce live, I imagine you need a well-stocked pedalboard. What do you have on it? ...[Electro-Harmonix] Small Stone phaser..."
In response to a question about his board, Matt lists the EHX Small Stone.
" astroflexagram #pedalboardfreak #shoegaze #guitarporn #electroharmonix #deluxememoryman #superfuzz #voodoolab #mxr #phase90 #dittolooper #bossps3 #smallstone #ravishsitar #twintube #tech21 #sansamp #pulsar #greenmachine #aramateffects #bossdd5 #bossdd3 #bosstu #guitareffects #guitarfx #seymourduncan #korg #1spot #geartalk #pedalboard @astroflexagram"
Seen in his Studio bete noire interview. When asked about the Small Stone he said "it is chewy, yet subtle. 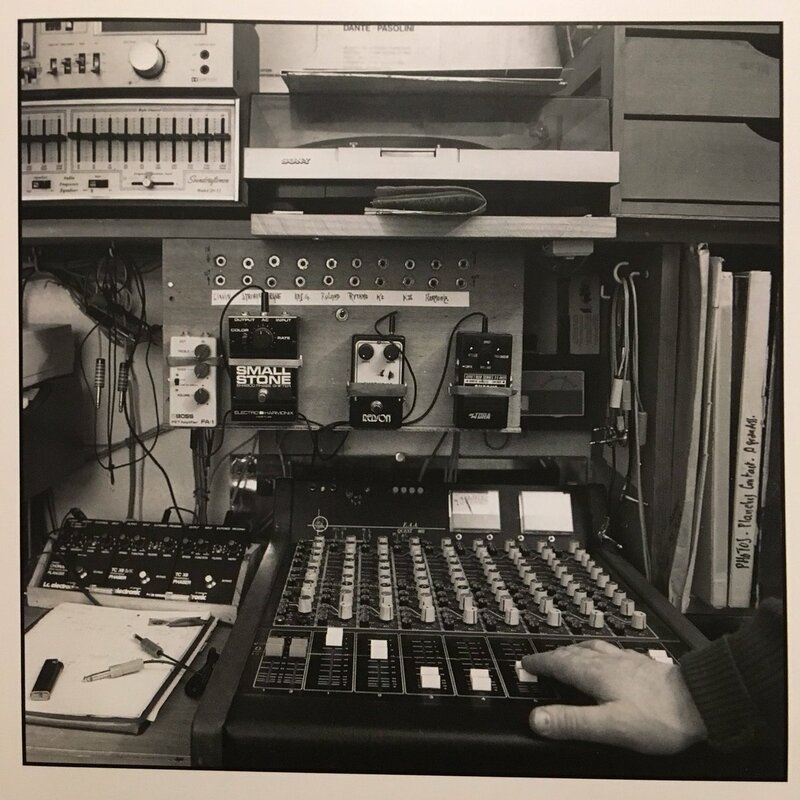 Frankly, I love it"
He said that he uses it when was asked "With so many sounds on the GOASTT record to reproduce live, I imagine you need a well-stocked pedalboard. What do you have on it?" Visible on Fender's pedalboard at 2:15 in the music video for his song "Leave Fast." Can be seen a 6:37. Interview with guitarist Paul Michael Davies here. Electro Harmonix Small Stone is included in the list of Gareth Jones' gear. The origin of the Small Stone dates back to 1974, when Electro Harmonix president Mike Matthews hired former EMS engineer David Cockerell, whos first design for EH was the Small Stone phaser. The design was based on Davids previous work on the EMS Synthi Hi-Fli from 1971 - it is a rather unique design in that it uses Operational Transconductance Amplifiers (OTA) instead of operational amplifiers with variable resistors. It is a 4 stage phase shifter with one additional stage for feedback, which can be activated using the "Color" switch. The strongest rival of the Small Stone, the MXR Phase 90, uses FETs (Field Effect Transistor), which suffer from the fact that the FETs have to be matched in production. This made the Phase 90 more expensive and gave the Small Stone an edge in the market share. Soundwise the OTA based phaser will give it's unique flavour with rather strong third harmonic distortion, whereas the FET based phaser has a pronounced second harmonic distortion - the matter of which one is better is simply a matter of taste. Throughout its history the Small Stone has had numerous revisions and modifications - all versions are OTA based, but the changes will affect the sound of the unit. Here's a short overview and comparison of the different versions of the EH Small Stone. The controls of the Small Stone have remained unchanged troughout its history - a SPEED-control, a switch labelled COLOR, which adds feedback to the circuit resulting in a deeper and stronger sounding phasing effect with many more notches added to the spectrum, an finally - the footswitch to toggle the effect on and off. Gotta love the unique sound of the small stone! The Small Stone is a great fet-based phaser design with the MXR phase90 'like it or lumb it' single knob that controls rate as well as depth. There is also a switch that changes the voicing, I believe by changing the number of stages of phasing. I am not 100%. Mine was a 2nd issue from the 70s. It was not true bypass or well buffered and was a real tonesucker when not engaged, so I modded it for true bypass. When I did so I found that the smalls tone suffered the classic 70s modulation stompbox volume drop. It was easily remedied with a few a tweaks that also improved the way the smalls tone interacted with the amp so that the upper harmonics at the top of its sweep would REALLY pop. I don't know if the current issue Small Stones are built this way, but if not they should be. All the right parts were in mine other than a DPDT footswitch. The Small Stone is just great and has an instantly recognizable sound that is totally different than a Phase 90. Its hard to dial a bad sound in with the Small Stone with its 2 lousy controls. I just can't say enough good things about this pedal. Everyone should try a Small Stone against a phase 90 and a decent univibe clone. All 3 iconic tones and all so different. One knob pedals are the best. The color switch allows you to switch between subtle phasing and drastic wide sweeps. With synths it produces the well known Jean Michel Jarre pad sound as he used the small stone to process his synths. There are many versions available with small improvements. The newest version even got a smaller footprint.